SkyMall has returned to the air, but customers don't have wait for their next flight to browse its unusual selection of products. After filing for Chapter 11 bankruptcy early this year, the catalog returned in October as an insert inside United Airlines' in-flight magazine, Hemispheres. It followed up that issue with a 36-page holiday edition, which, along with its inclusion in Hemispheres, was also mailed directly to its best customers. The direct-mail approach provided a window into SkyMall's future, according to C&A Marketing executive vice president Chaim Pikarski. Pikarski told CNNMoney that SkyMall will no longer be a "pure in-flight" catalog. "The way you run a catalog business is by mailing them to people or by engaging them in e-commerce," he said. 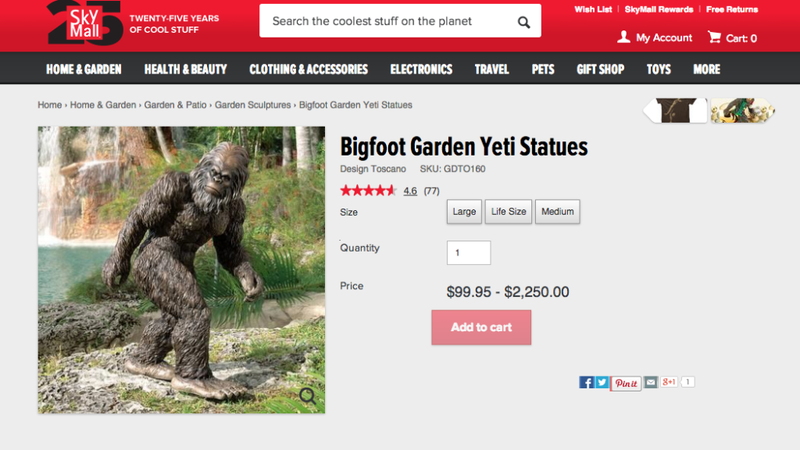 SkyMall, with its oddball products like the Bigfoot Garden Yeti statue, suffered a decline after airlines began to relax the restrictions on the use of electronics during flights. Delta and Southwest both ended their contracts with SkyMall late last year. Pikarski said that SkyMall's "dramatically upgraded" website will supplement a "limited amount of home mailings." Along with United, SkyMall is also available on Amtrak in the northeastern United States. But Pikarski said that the days of SkyMall appearing in every airline are over. The catalog may be available in another airline next year, though he said he has yet to decide "how much in-flight we will do." Airline passengers, as it turns out, never made for the most reliable customers. "Even in the past when people did read SkyMall in-flight, they read it as entertainment," he said. "It was not a call to action to buy."